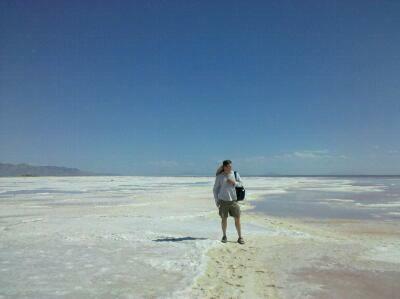 Ever since first hearing about the Spiral Jetty, I wanted to visit it. To those that haven’t heard of it before, the Spiral Jetty is a large, outdoor art construction in the middle of nowhere, a spiral made of boulders that stretches into the Great Salt Lake. Sometimes it’s visible; other times, it’s not. We stopped off to see the Spiral Jetty on our way down to Park City, Utah. The road out to the lake was even rougher than I had heard, but the end more than justified the means. Walking around the edge of the Great Salt Lake, the dried salt layer cracks beneath your feet, looking and sounding a lot like ice, except for shallow pools of multi-colored briny water beneath. 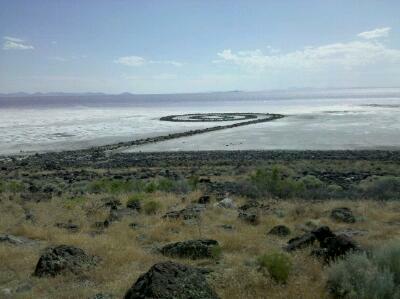 The Spiral Jetty impressed me more than I expected. The size of the piece matches the landscape, a cosmic, natural, and human shape, the spiral, reaching out into a seemingly infinite shallow sea.